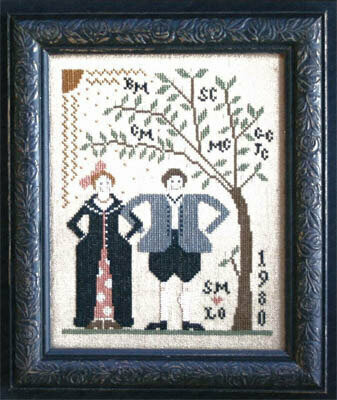 Model stitched on 36ct. 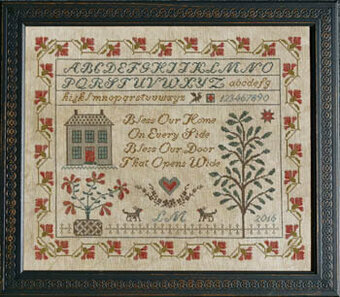 Pear Linen using The Gentle Arts Sampler Threads. DMC alternative: 501, 315, 975, 407, 3011, 844, 869. Stitch count is 118W X 95H. 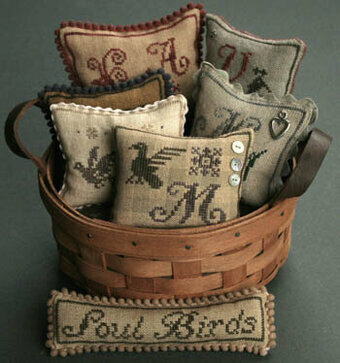 Model stitched on Confederate Gray 30 count linen using Needlepoint Silk thread. DMC alternative: 310, 3782, 898, 3858, 3787, 3861. Stitch count: 66x x 94h. 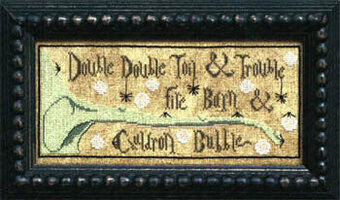 "Double double toil & trouble", "fire burn & cauldron bubble" Model was stitched on 35 ct Havanna linen using Needlepoint Silk colors. DMC conversions (310, 3787, 3064, 3348, 3052, 3782). Stitch count: 167W x 66H. 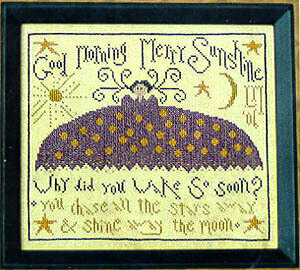 Good morning merry sunshine - why did you wake so soon? You chase all the stars away & shine away the moon". 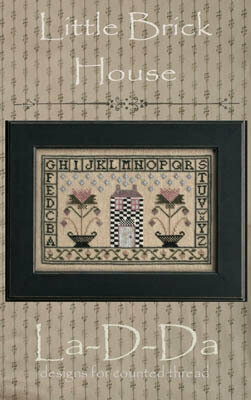 Model stitched on 35 count Brimstone Linen with Needlepoint Silk (DMC conversions are 832 3740 3829 3772 3021). 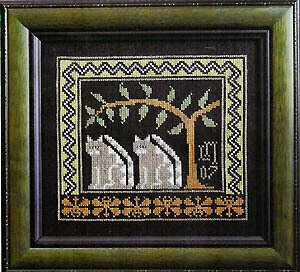 The stitch count is 135W x 113H. 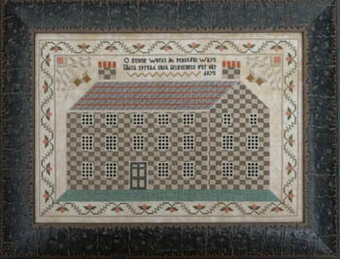 Model stitched on 35 count Straw Weeks Dye Works Linen with Gloriana Silk. DMC conversions are 310 502 918 221. The stitch count is 97W x 120H. 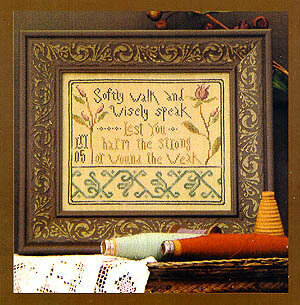 Models stitched on 6" squares of fabric with Weeks Dye Works and Gentle Art Sampler threads (or DMC 310, 611, 3777, 645, 3032, 451, 500). 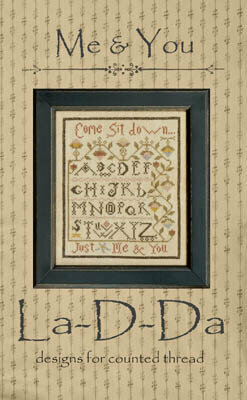 An alphabet chart is enclosed to personalize the designs. 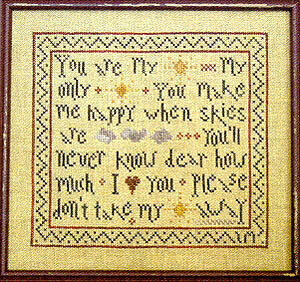 Model stitched over 2 threads on 30 Ct Straw with Gentle Arts Simply wool (or DMC 648, 3033, 3864, 3041, 223, 935, 318, 310, 844) Stitch count 135x86. "You are my sunshine, my only sunshine. You make me happy when skies are blue. You'll never know dear how much I love you. Please don't take my sunshine away." 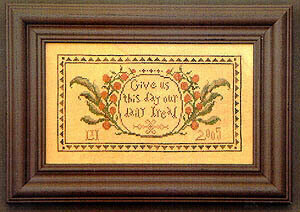 Model stitched on 35ct. Kansas City Blend Linen with Classic Colorworks Thread. DMC alternates are 3371 832 902 451 452. Stitch count is 109W X 94H. 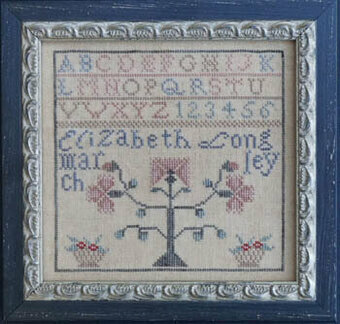 Model stitched on 35 count linen using Gentle Art Sampler threads: Dried Thyme, Maple Syrup, Tarnished Gold, Forest Glade, Gingersnap. Stitch count: 151x75. 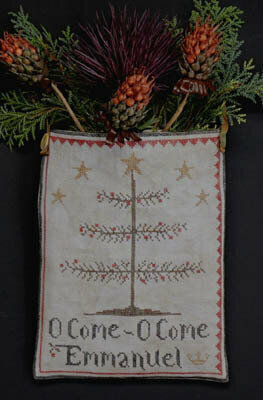 "Bless our home on every side, bless our door that opens wide." Model stitched on 36 Ct. Chocolate Milk line by Hand Dyed Fabrics by Stephanie using one strand over two threads of linen. 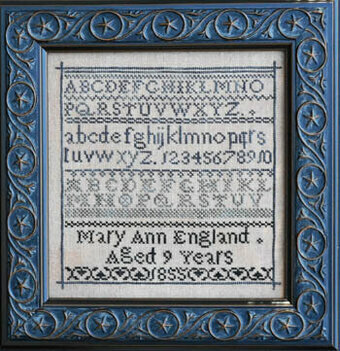 Stitched using both Gentle Art Sampler threads and Weeks Dye Works, along with some DMC (DMC alternates for overdyes are as follows 501 841 934 3362 3777 3799) Stitch Count: 289W x 233H. 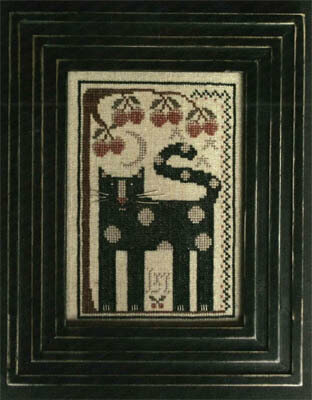 Model stitched on 32 count Black Linen with Needlepoint Silk (DMC alternative: 3828, 3013, 645, 3866, 3363). The stitch count is 99W x 88H. "Come sit down, just me & you." Model stitched on 40 Ct. Straw linen with DMC floss. Stitch Count: 90x110. 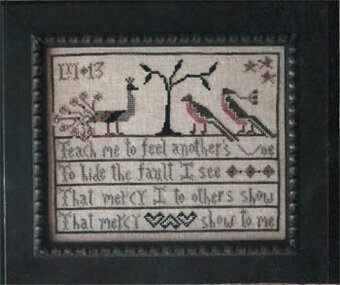 "Teach me to feel another's woe, to hide the fault I see that mercy to others show, that mercy show to me." Model stitched over two threads on 30 Ct. Confederate Gray linen with Weeks Dye Works Floss (or DMC 3777, 310, 645, 3781, 3862, 3712, 3032). Stitch Count: 124W x 97H. Model stitched on 35 Ct. 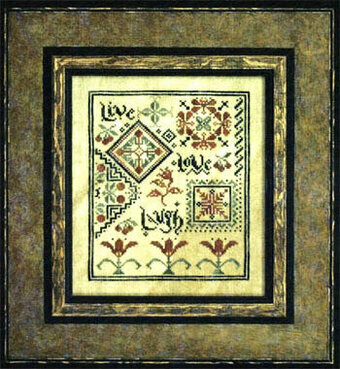 Straw linen with Needlepoint Inc Silks (or DMC 310, 3768, 407, 434, 831, 644, 3021, 936, 3721), or Gentle Art Sampler threads (Black Crow, Old Blue Paint, Flax, Sarsparilla, Grecian Gold, Parchment, Soot, Forest Glad, Old Red Paint). Stitch Count: 58W x 126H. 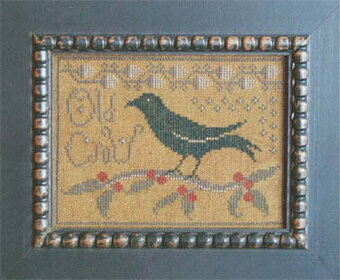 Model stitched on 30 count Chestnut Linen with Needlepoint Inc. Silk. Stitch count: 88W x 66H.